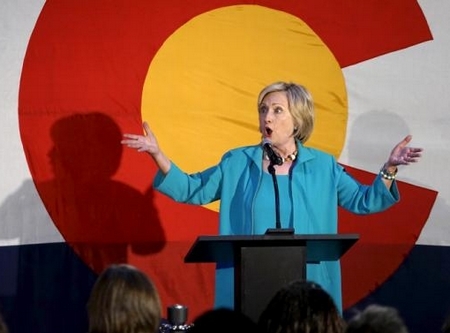 by Rod Martin, Contributing Author:: Most important political fact of the prior week: Hillary has imploded in Colorado. All of this will play out in light of the second most important political fact last week: Democrats’ over-the-top tone-deafness on security. By the way, an important side note: did you happen to see the video of a stadium full of Turkish soccer fans booing the suggestion of a moment of silence for the Paris victims, and then chanting “Allah Akbar”? As discussed previously, Turkey’s re-election of would-be Sultan Recep Erdogan represents the consolidation of Islamist power in our NATO ally and prospective EU and Schengen Zone member. No one seems to be taking this very seriously either. Except perhaps Marine Le Pen. All of which brings us to our third most important political fact, which is that a realignment is very possible. Tags: Rod Martin, RodMartin.org, Hillary Clinton, Imploded in Colorado, other political facts To share or post to your site, click on "Post Link". Please mention / link to the ARRA News Service. and "Like" Facebook Page - Thanks!